UV resistant print effectively promotes messages. It is quite common for the pool to be misused. However, if you want to enforce certain rules for the pool, get our custom pool signs. At BannerBuzz.com, we have a wide range of pool rules signs that can be used to protect the pool and implement hygiene and cleanliness rules. You can browse through our extensive range of pool signs or customize one for better results. If you want to add unique and custom pool signs to your pool area, check out our extensive variety of funny signs. 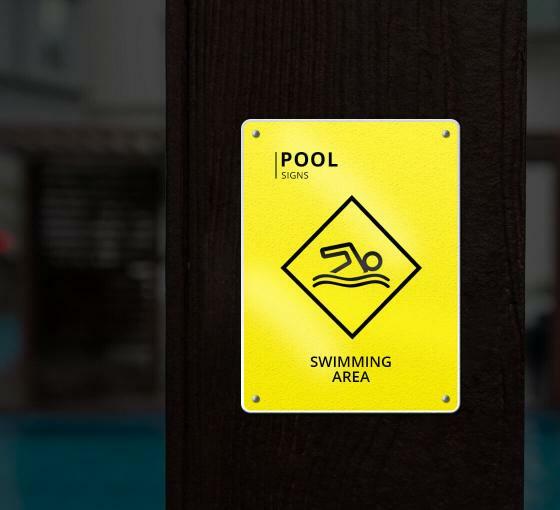 From keeping people from taking a dip in their underwear to preventing unhygienic pool conditions, these signs serve all kinds of purpose in a humorous manner. Whether it is a residential pool or a commercial one, our signs can offer great help in maintaining stringent pool rules. When it comes to outdoor signs, it is important to choose the one that is rust-resistant and high quality. At BannerBuzz.com, we have premium material signs that not only stay intact under the sun, but also remain in perfect shape for several years. So, when you are investing in one of our pool rules signs, you are investing in a durable product that will stay in place for longer.